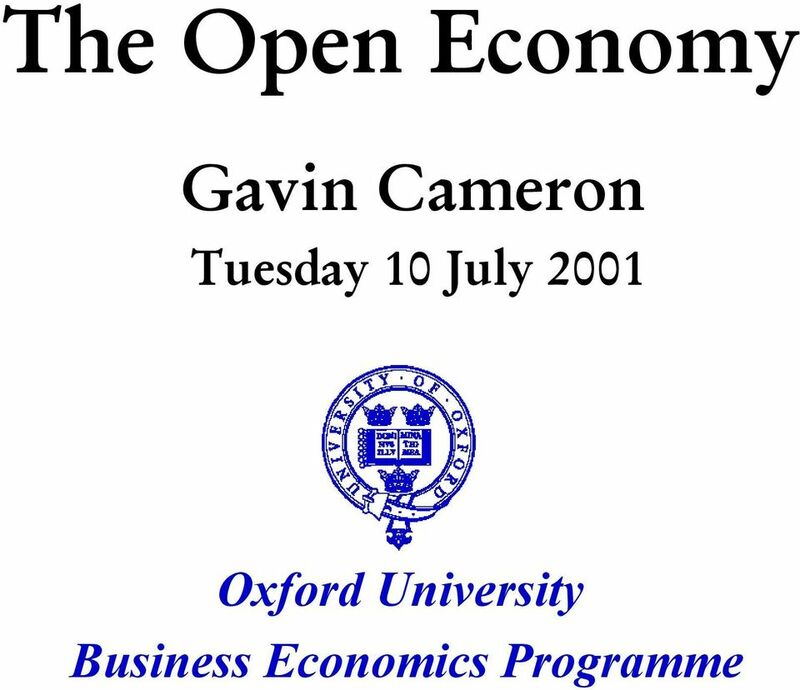 Download "Oxford University Business Economics Programme"
3 supply and demand in the FX market If the /EURO rate falls: Euroland goods cheaper in Japan Japanese goods more expensive in Euroland Euroland exports rise Japanese demand more Euros and offer to supply more Yen Japanese exports fall Eurolanders demand fewer Yen and offer to supply fewer Euros. 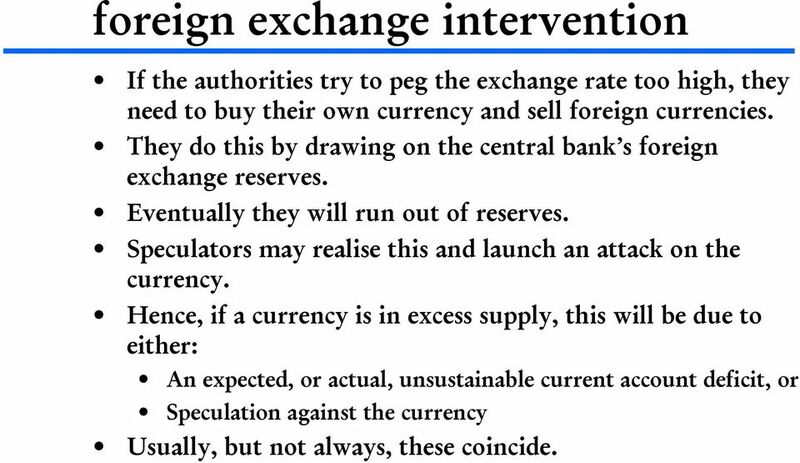 6 foreign exchange intervention If the authorities try to peg the exchange rate too high, they need to buy their own currency and sell foreign currencies. They do this by drawing on the central bank s foreign exchange reserves. Eventually they will run out of reserves. Speculators may realise this and launch an attack on the currency. Hence, if a currency is in excess supply, this will be due to either: An expected, or actual, unsustainable current account deficit, or Speculation against the currency Usually, but not always, these coincide. 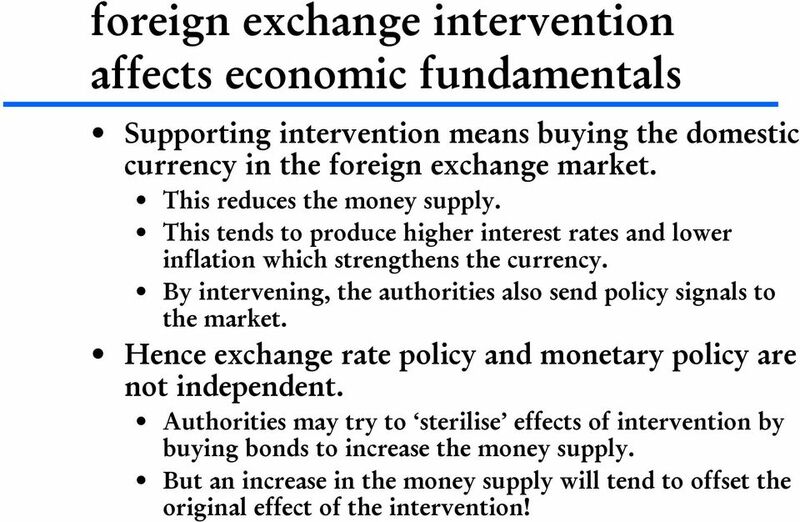 7 foreign exchange intervention affects economic fundamentals Supporting intervention means buying the domestic currency in the foreign exchange market. This reduces the money supply. This tends to produce higher interest rates and lower inflation which strengthens the currency. By intervening, the authorities also send policy signals to the market. Hence exchange rate policy and monetary policy are not independent. Authorities may try to sterilise effects of intervention by buying bonds to increase the money supply. 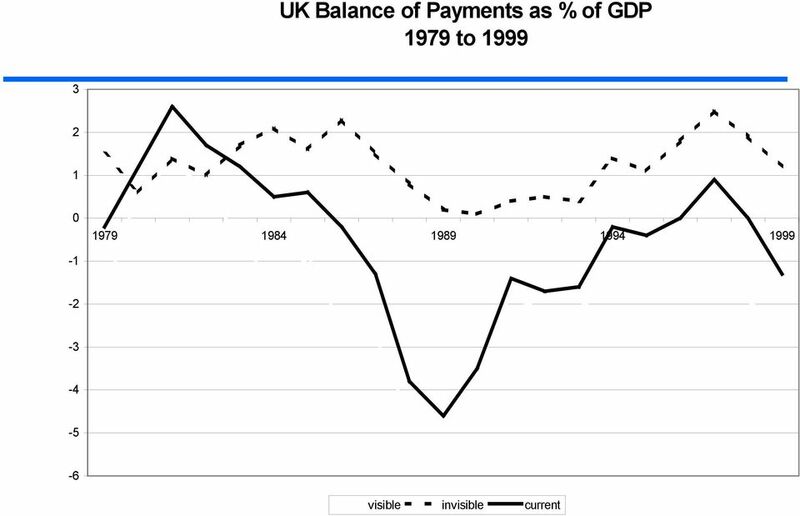 But an increase in the money supply will tend to offset the original effect of the intervention! 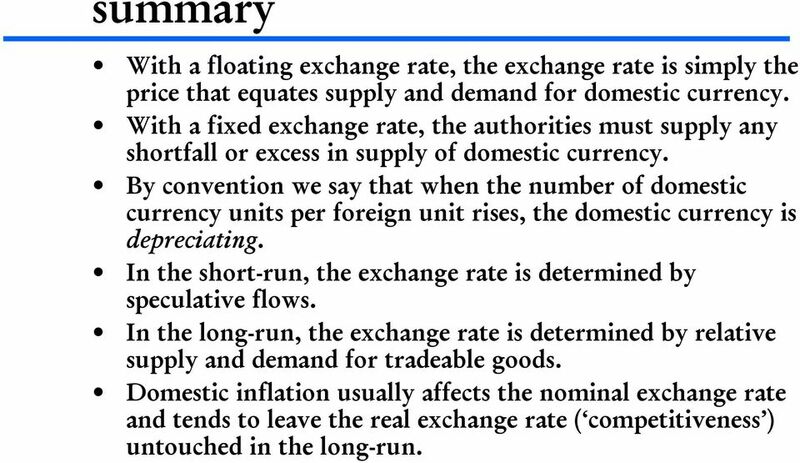 11 the exchange rate When exchange rates float freely, what determines their level? 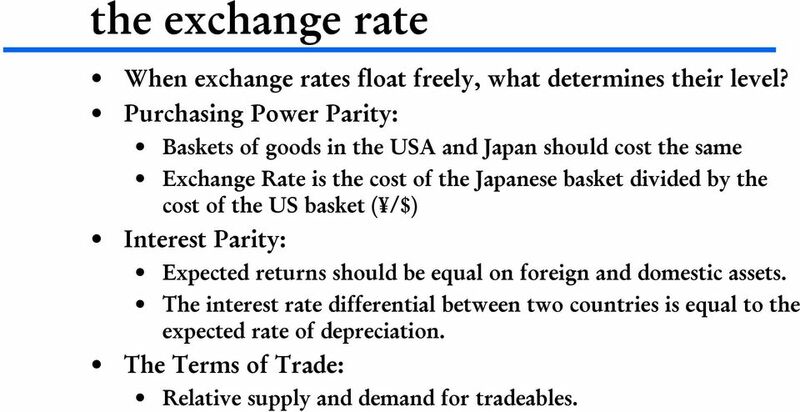 Purchasing Power Parity: Baskets of goods in the USA and Japan should cost the same Exchange Rate is the cost of the Japanese basket divided by the cost of the US basket ( /$) Interest Parity: Expected returns should be equal on foreign and domestic assets. 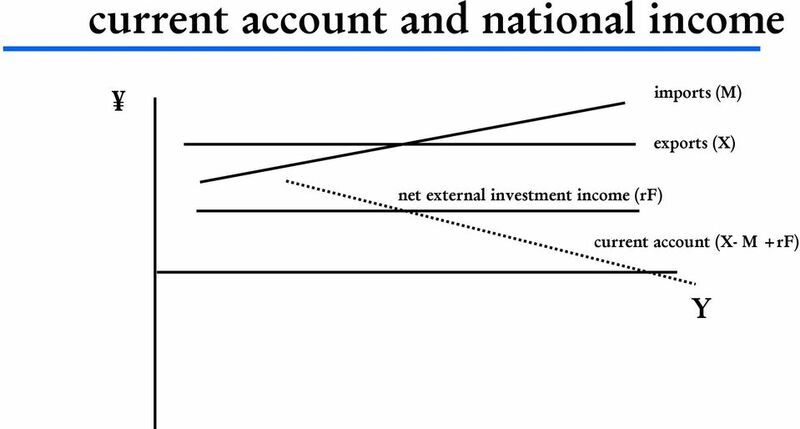 The interest rate differential between two countries is equal to the expected rate of depreciation. The Terms of Trade: Relative supply and demand for tradeables. 12 problems with PPP What is in the baskets? Should be tradeable goods only, not Big Macs! How quickly does arbitrage work? In the short-run, capital movements are likely to be more important Must be true because nominal exchange rates are far more volatile than relative national price levels. 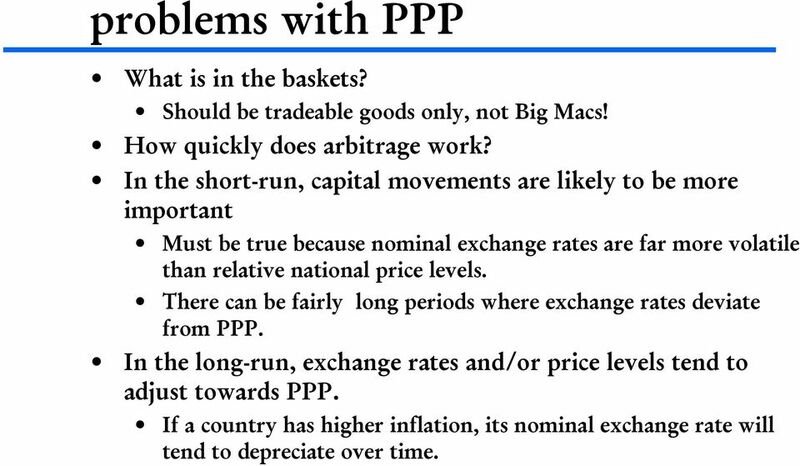 There can be fairly long periods where exchange rates deviate from PPP. In the long-run, exchange rates and/or price levels tend to adjust towards PPP. 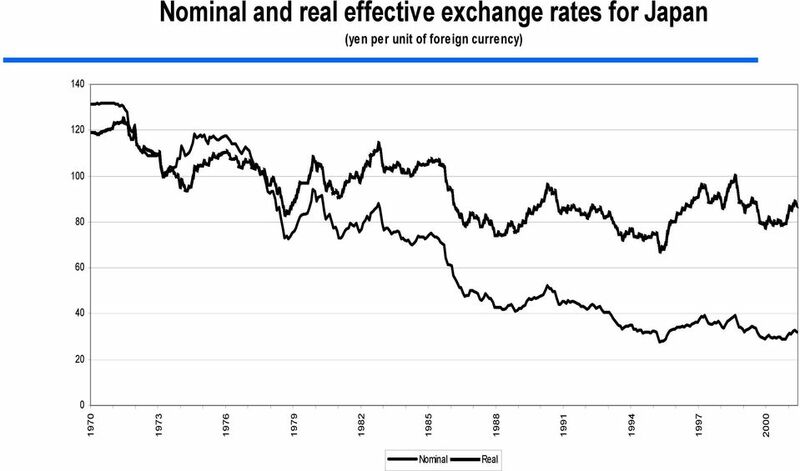 If a country has higher inflation, its nominal exchange rate will tend to depreciate over time. 13 the real exchange rate The nominal exchange rate may be defined as Units of domestic currency/units of foreign currency The Real exchange rate may be defined as The nominal exchange rate * (price of foreign goods/price of domestic goods) In these definitions, a rise in the exchange rate is a depreciation and a fall is an appreciation. As long as goods prices move together, the real exchange rate will be stable. If foreign prices rise faster than domestic prices, the nominal exchange rate will depreciate. 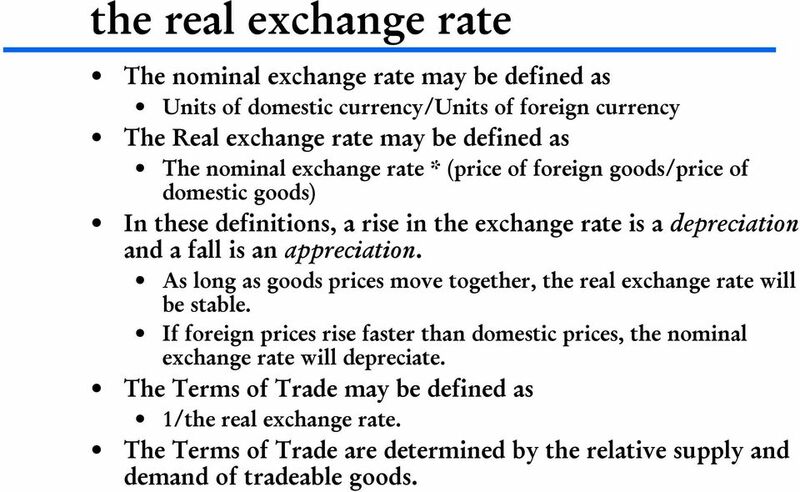 The Terms of Trade may be defined as 1/the real exchange rate. The Terms of Trade are determined by the relative supply and demand of tradeable goods. 14 what determines the real exchange rate? When PPP holds, money supply growth and hence inflation leads to changes in the nominal exchange rate, but not in the real exchange rate. 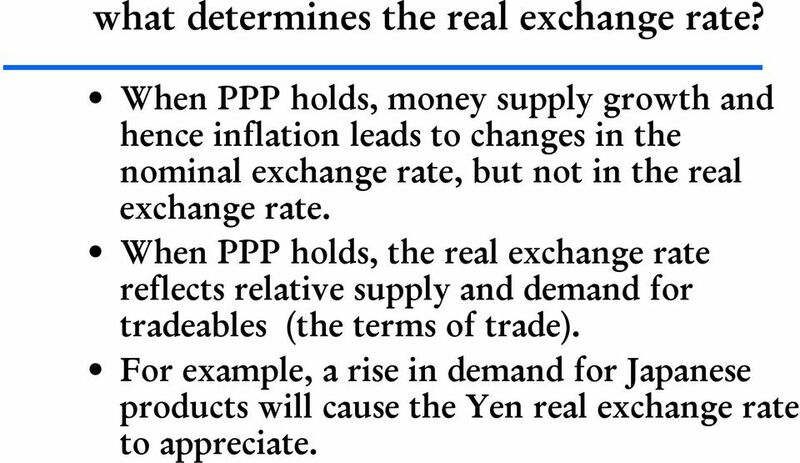 When PPP holds, the real exchange rate reflects relative supply and demand for tradeables (the terms of trade). 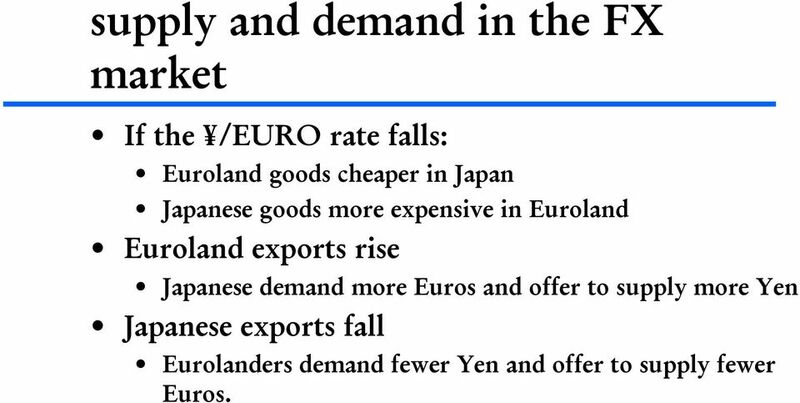 For example, a rise in demand for Japanese products will cause the Yen real exchange rate to appreciate. 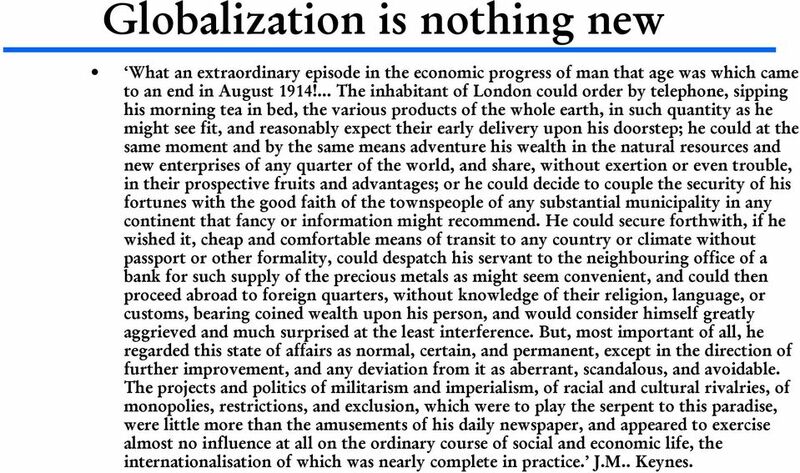 16 Globalization is nothing new What an extraordinary episode in the economic progress of man that age was which came to an end in August 1914!... The inhabitant of London could order by telephone, sipping his morning tea in bed, the various products of the whole earth, in such quantity as he might see fit, and reasonably expect their early delivery upon his doorstep; he could at the same moment and by the same means adventure his wealth in the natural resources and new enterprises of any quarter of the world, and share, without exertion or even trouble, in their prospective fruits and advantages; or he could decide to couple the security of his fortunes with the good faith of the townspeople of any substantial municipality in any continent that fancy or information might recommend. He could secure forthwith, if he wished it, cheap and comfortable means of transit to any country or climate without passport or other formality, could despatch his servant to the neighbouring office of a bank for such supply of the precious metals as might seem convenient, and could then proceed abroad to foreign quarters, without knowledge of their religion, language, or customs, bearing coined wealth upon his person, and would consider himself greatly aggrieved and much surprised at the least interference. But, most important of all, he regarded this state of affairs as normal, certain, and permanent, except in the direction of further improvement, and any deviation from it as aberrant, scandalous, and avoidable. The projects and politics of militarism and imperialism, of racial and cultural rivalries, of monopolies, restrictions, and exclusion, which were to play the serpent to this paradise, were little more than the amusements of his daily newspaper, and appeared to exercise almost no influence at all on the ordinary course of social and economic life, the internationalisation of which was nearly complete in practice. J.M.. Keynes. 17 summary With a floating exchange rate, the exchange rate is simply the price that equates supply and demand for domestic currency. With a fixed exchange rate, the authorities must supply any shortfall or excess in supply of domestic currency. By convention we say that when the number of domestic currency units per foreign unit rises, the domestic currency is depreciating. 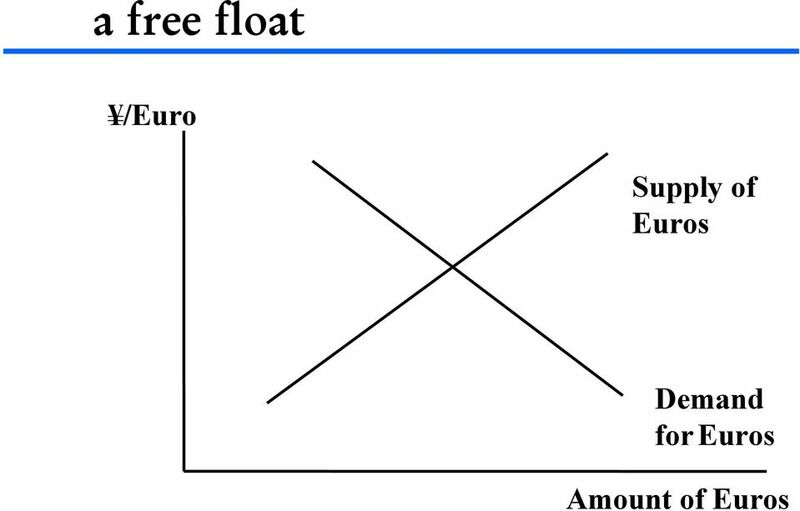 In the short-run, the exchange rate is determined by speculative flows. 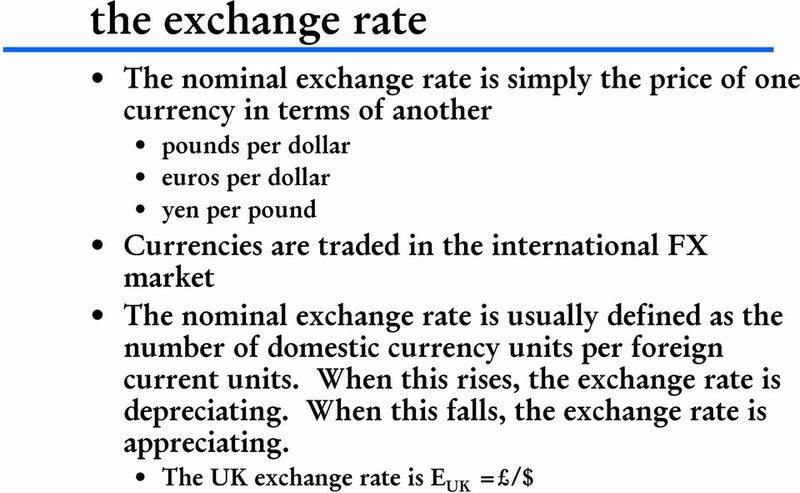 In the long-run, the exchange rate is determined by relative supply and demand for tradeable goods. Domestic inflation usually affects the nominal exchange rate and tends to leave the real exchange rate ( competitiveness ) untouched in the long-run. 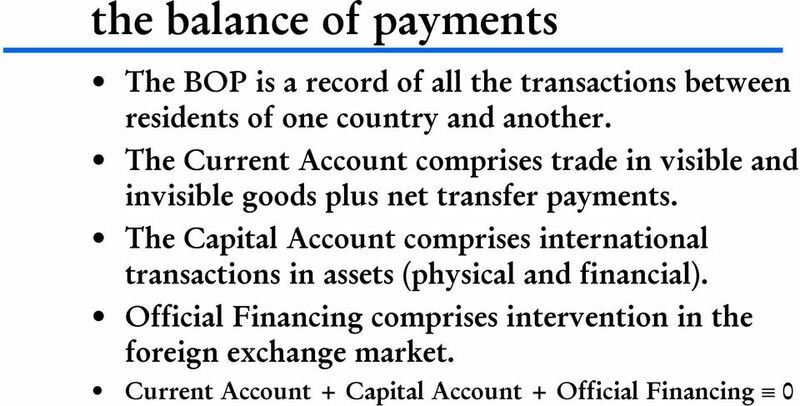 18 syndicate topics With a fixed exchange rate, the government has a balance of payments problem. With a floating exchange rate, it has an exchange rate problem. Which would you prefer? 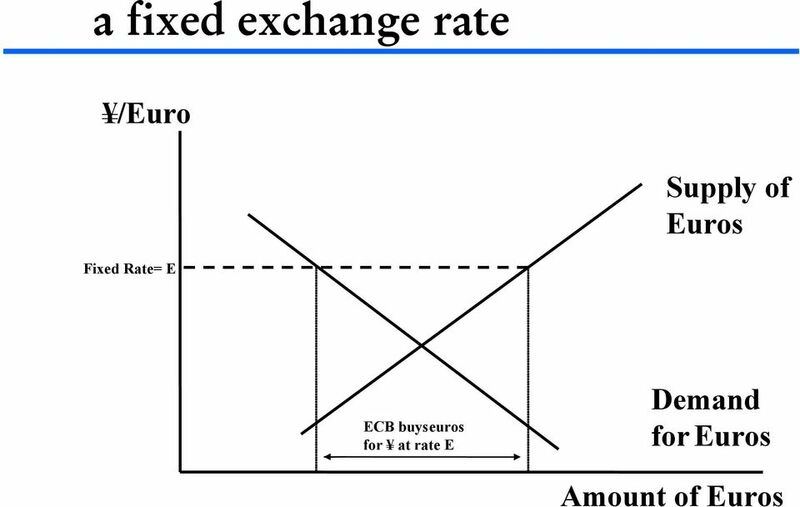 Why does a fixed exchange rate lead to a loss of monetary independence? What effect does international capital mobility have on this? 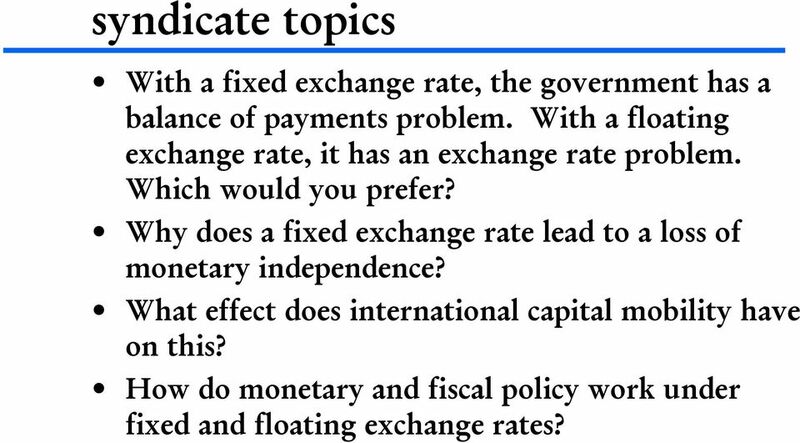 How do monetary and fiscal policy work under fixed and floating exchange rates?